Need a reliable, on-time porcelain tub chip repair in Tri-Cities, TN area? Call (423) 612-4174 to find out why so many homeowners choose Miraculous Makeovers to handle all of their Tri-Cities, TN porcelain sink repair needs. Visit our online specials page to save even more over replacement! If you own a home or business, and you have a porcelain tub. You probably don’t spend a lot of time thinking about the chips in your porcelain, until one day you run some bath water and your eyes can’t keep from focusing on those horrible chips. That’s when Miraculous Makeovers can help. 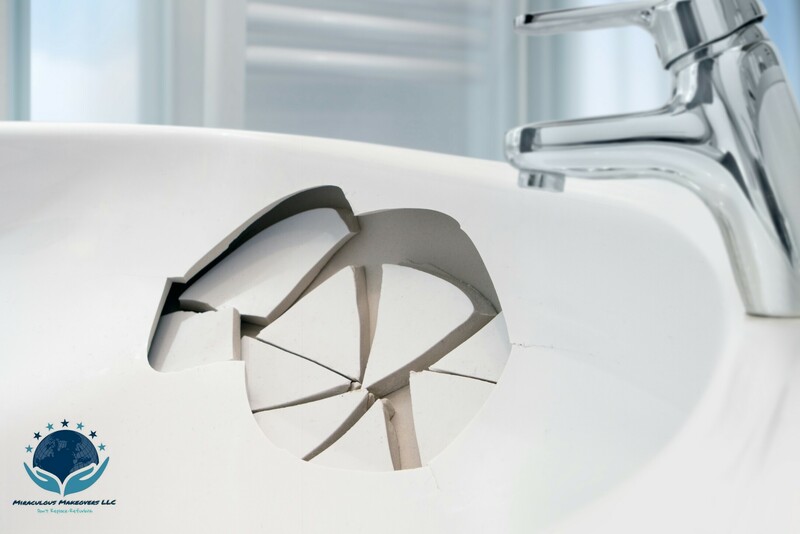 Whether your porcelain is old or new, our porcelain tub chip repair experts are reliable, experienced and on call 24 hours a day to respond to all your porcelain chip repair needs. We can repair then refinish your porcelain bathtub to look like it’s never been touched. We will get your porcelain bathtub repaired in no time. When porcelain tubs are being used on a constant basis, it’s easy for your tub to begin to chip. Rather than replacing your porcelain bathtub, you should consider how you can cost effectively refurbish your tub with porcelain tub chip repair. Our porcelain sink repair experts repair minor porcelain sink chips, but major chips in your porcelain bathtub or sink will require laborious work, so it’s best to work with a bathtub refinishing contractor that knows what to do. While you may not want to spend the money to replace your porcelain tub, bathtub chip repair cost is lower than replacing your entire unit and we will make your tub look as if it were never touched! Why Choose Porcelain Chip Fix Repair For Tubs and Sink? While there are many reasons to refinish and repair a porcelain tub and sink, here are some of the main reasons you may be considering it: chipping surface or the color is old and faded, going through a bathroom renovation on a budget, or just love items with history behind it. If you are considering porcelain tub chip repair, hiring a professional is essential to ensure the porcelain sink repair and restoration jobs done right the first time. How Do You Repair a Chipped Bathtub? Porcelain tub chip repair is a very easy process similar to porcelain figurine repair, as long as you follow the appropriate steps you will achieve a flawless repair. Clean the damaged area thoroughly utilizing a industrial strength cleaner, Ajax will work. Dry the chipped area thoroughly with a heat gun or hair dryer. The surface must be completely dry so that the materials will bond. Sand the chipped area with 180 grit wet or dry sandpaper until the damages become smooth. To avoid any scratches on the surrounding surface, sand only in the area where the chip is located. Clean the sanded area with a clean paper towel using a solvent such as acetone. Mix the putty with hardener on a clean cardboard box or inside a paper cup. Stir the putty and hardener with a wooden stick. Scoop up a small amount of putty with a razor blade and apply it over the chipped area. Spread the putty from the center to the edges of the chipped surface add putty as needed, until it completely fills in the chipped area. Sand the excess putty until its smooth as the surrounding tub surface. Let the putty dry for at least 15 minutes. Apply bonding agent then mix refinishing materials and spray the minimum of four coats utilizing an airbrush gun. There is no subsistence of the best porcelain repair kit. We advise hiring a reliable pro that will utilize state of the art products and give a written warranty. Our porcelain chip repairs are more effective then other porcelain tub repair companies in Tri-Cities, TN we only utilize the best products and our processes can’t be matched. Our refinishers are always prepared to go above and beyond to make our customers happy and to provide fast, cost effective solutions to your bathroom and kitchen issues. Have porcelain tub chip problems that needs to be seen immediately or need the services of a expert Tri-Cities, TN porcelain tub chip repair contractor you can count on? Contact Miraculous Makeovers today at (423) 612-4174.